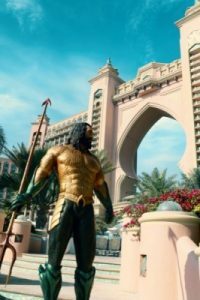 Atlantis, The Palm in Dubai has partnered with Warner Bros. Pictures for the “Aquaman” movie launch, to give guests and visitors a taste of what it’s like to live the life of the aquatic Super Hero. 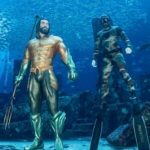 The ocean-themed entertainment resort is offering fans a chance to harness Aquaman’s superpowers by “breathing” underwater and exploring the deep, with 20% off general online admission prices on all dive activities in The Ambassador Lagoon on visits from 12th December until 31st January 2019. Guests simply need to present an Aquaman movie ticket/receipt to redeem on activities including Atlantis Aquatrek, Ray Feeding, Shark Safari, Ultimate Snorkel, Dive Discovery, Dive Explorer and the chilling Predator Dive. Bookings can be made at The Lost Chambers. A stay for two adults in an Underwater Suite for two nights. Each Underwater Suite comes equipped with a 24-hour butler and floor-to-ceiling views looking upon the majestic underwater Ambassador Lagoon. A Dolphin Adventure for two at Dolphin Bay. Guests can swim with dolphins in this deep-water encounter. A Fish Tales Tour for two in The Lost Chambers Aquarium. Whilst Atlantis, The Palm can’t teach guests to communicate telepathically to fish like Aquaman can, they can help budding ichthyologists get well acquainted with various species. During the tour, guests will be introduced to some of the 65,000 marine animals that call Atlantis their home, including a visit to the shark and ray nursery. A private personal training session for two in ShuiQi Spa and Fitness followed by a 60-minute full body massage. First develop superhuman strength like Aquaman, then relax like a Super Hero, too. An Atlantis Aquatrek experience for two. What’s a day in the life of Aquaman without being able to breath underwater? Atlantis invites guests to do just that with a special scuba experience. An underwater dinner for two in the award-winning seafood restaurant Ossiano. In the film, Aquaman spends a lot of time in the water, but also steps onto solid ground to visit his dad and sample a beverage or two, and maybe a little seafood. Guests can therefore dine their way through a seven-course set menu with wine pairing, while otherworldly stingrays glide by like small Atlantean ships. For the months of December and January, Atlantis The Palm will come to life with an “Aquaman” movie-inspired theme, providing touchpoints for guests and visitors to “interact” with the Super Hero. Guests can grab a selfie with a two-metre tall Aquaman statue in The Lost Chambers Aquarium, enjoy an “Aquaman”-themed cocktail, and watch unique action-loaded, behind-the-scenes footage of the movie on in-resort screens. Guests and residents can also book the Aquaman staycation package, which includes a 3-night stay in a room or suite with a complimentary Aquatrek experience for two guests. Stays must be booked by 31st January and redeemed by 31st December 2019. Prices start at 999AED (approximately $378 AUD). From Warner Bros. Pictures and director James Wan comes an action-packed adventure that spans the vast, visually breathtaking underwater world of the seven seas, “Aquaman”, starring Jason Momoa in the title role. The film reveals the origin story of half-human, half-Atlantean Arthur Curry and takes him on the journey of his lifetime—one that will not only force him to face who he really is, but to discover if he is worthy of who he was born to be…a king. The film also stars Amber Heard, Oscar nominee Willem Dafoe, Patrick Wilson, Dolph Lundgren, Yahya Abdul-Mateen II, and Oscar winner Nicole Kidman. Wan directs from a screenplay by David Leslie Johnson-McGoldrick and Will Beall, story by Geoff Johns & James Wan and Will Beall, based on characters created by Paul Norris and Mort Weisinger for DC. The film is produced by Peter Safran and Rob Cowan, with Deborah Snyder, Zack Snyder, Jon Berg, Geoff Johns and Walter Hamada serving as executive producers. Warner Bros. Pictures presents a Peter Safran Production, a James Wan Film, “Aquaman” which will hit UAE theaters on December 13th in 3D and 2D and IMAX and will be distributed worldwide by Warner Bros. Pictures.